Bodmer, born in Riesbach, near Zurich, first studied with his uncle, Johann Jacob Meyer, a Swiss painter and engraver. He later studied in Paris. 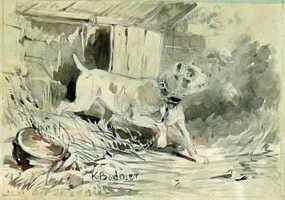 While on a sketching trip through Germany with his brother in 1832, Bodmer met Prince Alexander Philip Maximilian of Weid-Neuwied who was looking for a professional artist to accompany him on a natural history expedition to North America. He engaged Bodmer, who was then only 23 years old, and from 1833 to 1834, traveling up the Missouri River, retracing the 1805 journey of Lewis and Clark, the young artist created some of his most important works. He depicted some of the same characters that George Caitlin had painted just a few months before. He was the last artist to paint the Mandan Indians in North Dakota just before almost the entire tribe was wiped out by the smallpox epidemic of 1837. He created 81 paintings as illustrations of Maximilian’s expedition; they were published as lithographs in 1843 in Travels in the Interior of America. Bodmer returned to Paris and never revisited America. Back in France, Bodmer was associated with the Barbizon School of painters, especially with Millet and Rousseau. In 1849 he settled in the village of Barbizon where lived for the rest of his life, became a naturalized French citizen, and painted in the Forest of Fontainebleau. Bodmer exhibited in the Paris Salon exhibitions from 1836. He also took part in exhibitions in Marseilles, Vienna, and other cities. 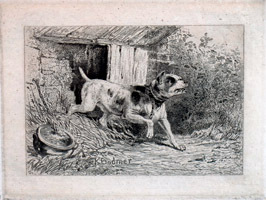 A preparatory drawing for Bodmer’s etching of the same subject. A fine proof on laid paper of the final state.